Well, here we are at the end of another year together, friends. I tell you, nothing happened the way that it was supposed to in this last month, but there were many blessings, nonetheless. And as we ready ourselves to propel forward into 2016, I've got a look at some tools from Papertrey Ink to help you get organized. Oh, and I made a video for this blog post, which is a challenge I have been putting off for months. But I've done it! The reason for the video was to give you a glance into the Moments Inked 2016 Planner System from PTI. It is worth the look, I promise you, so please take a few minutes and watch--but keep in mind that it's the first video I've ever done in my entire life, and I was in the middle of a cold so please be kind. 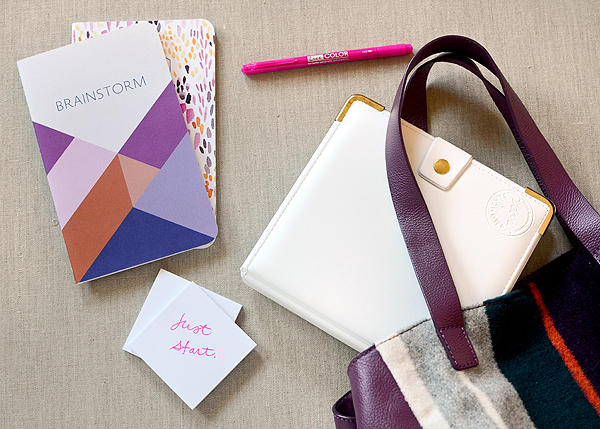 This year, the planners are coming in two formats--a spiral bound and binder edition. While I had been planning to primarily use the binder, I'm actually quite taken with the spiral version as well. It's much thinner than last year's book, as they've taken out the daily pages, and what's left after you remove those is a perfectly sized and manageable planner. The silver metal coil is a big improvement, too, and with the cover I chose (there are several covers to pick from), it looks so light and airy (but the metal coil actually feels a whole lot sturdier than the plastic one from last year). I really love it! The video gives you an overview of the inside--it's almost exactly the same as it's predecessor, and I find nothing wrong with that. There are monthly and weekly pages, along with a few lined pages at the end of the month for extra notes. It's compatible with all of 2015's dies and stamps sets, as well, so there's no need to buy a whole new set of products. When Nichole told us they were coming out with a binder version, I couldn't wait for it. I've been shopping for a binder planner for months but because I'm somewhat indecisive when it comes to them and the market is saturated, it's hard to choose. I also don't need, nor do I want 10 different planners, so I just kind of gave up on them until I heard about PTI's. I'm happy I waited because I love this! They offer a few color choices (Natural Tan, Ebony, Stone Gray), and I chose the White for it's clean, crisp appearance. 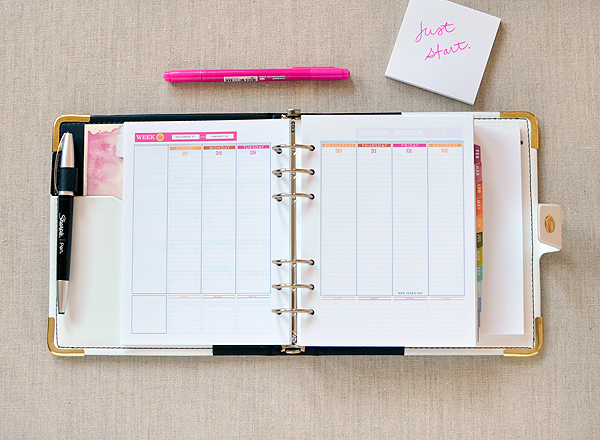 It looks and makes me feel very professional--which is sort of a weighty thing to say about a planner, but I think you know what I mean. My favorite thing about a binder planner is the ability to tuck everything into it, close it up, and take it anywhere. Whether anywhere is the kitchen, the grocery store, or on vacation, it's just convenient. So, what's inside of this thing? Well, again, it's very similar to last year's setup, without the daily pages. It's important to note that the content is exactly the same for the binder and spiral versions, so whatever your preference is in format, you won't miss out. You can set yourself a few goals at the beginning of the year. 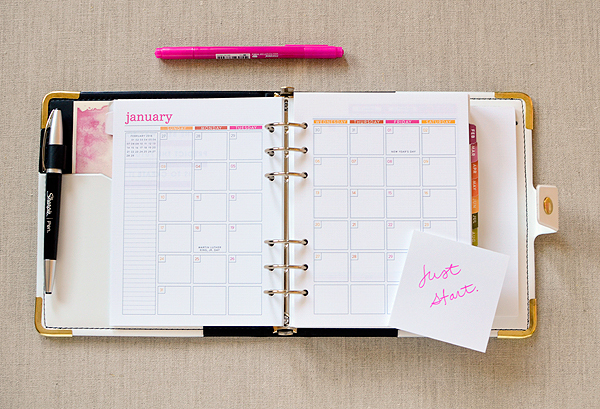 Whether you're a fan of resolutions or not, a little goal setting is good for you, I feel! 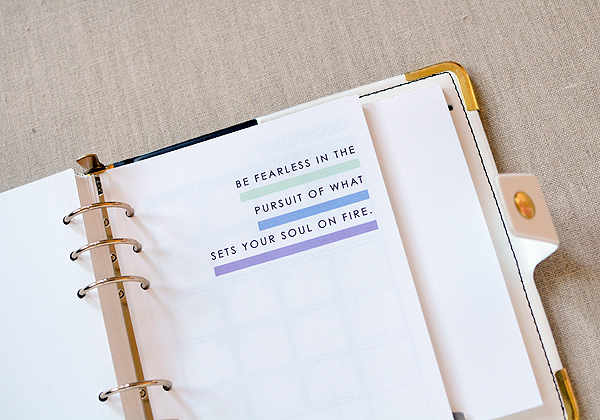 Begin each month with an inspiring quote...One of my favorite attributes from last year so I'm happy these are back. And the week, too...This year, the days aren't broken down into sections anymore, and I'm happy with that change, as well, since most of our appointments are happening in the earlier part of the day rather than the latter. I always ran out of room to write in 2015! 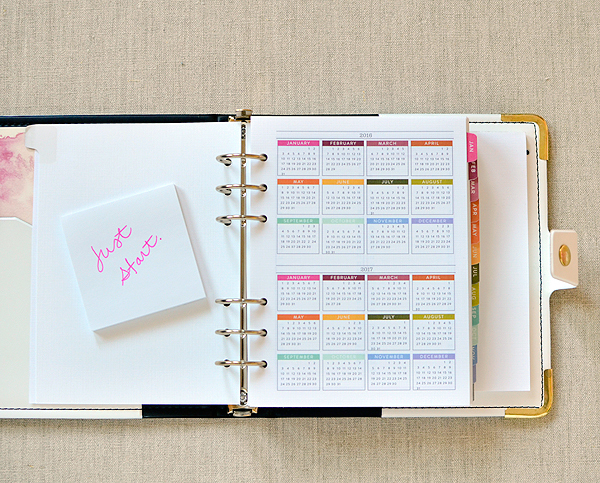 Keep track of important contacts in the back of the book, and there are pages for important dates at the front. 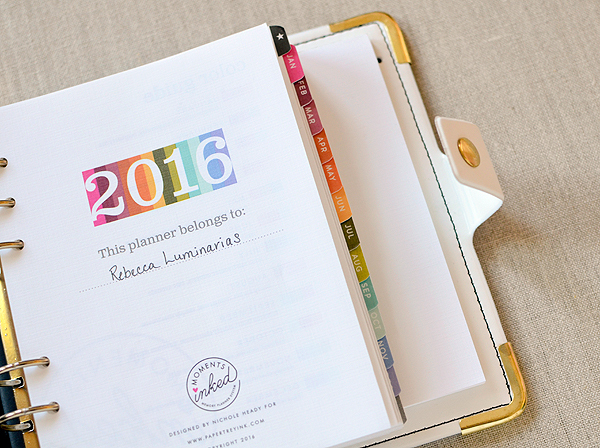 I used both of these tools quite a bit in my 2015 planner, which means they'll be easy to fill in for 2016! 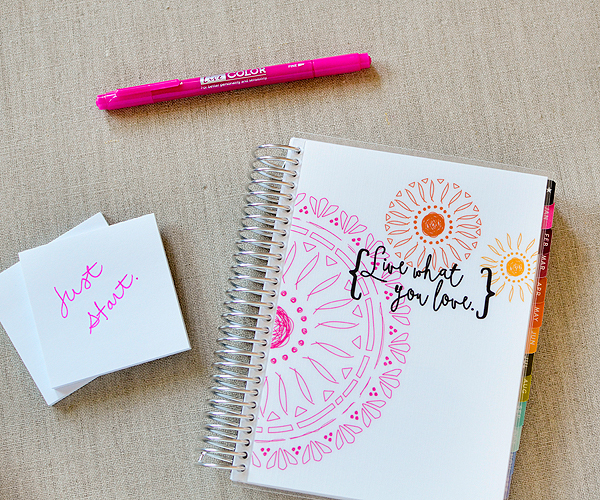 One of the best things of all are these notepads! 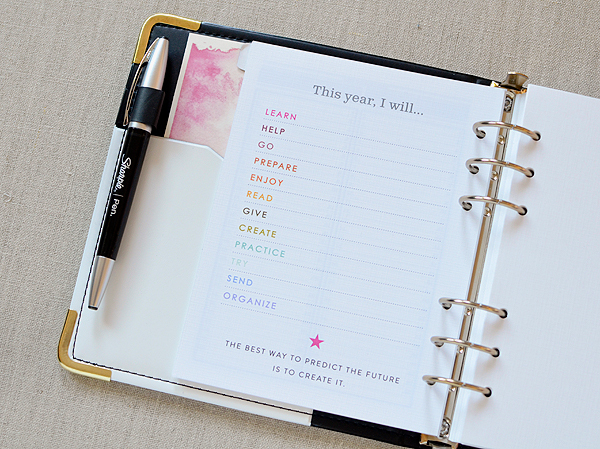 I am a list maker--all day long, I make lists--and I'm pretty sure there isn't a monthly planner out there that has enough room for all of the random and necessary things I jot down on a daily basis. That's why I love these list pads so much! They are incredibly convenient, they're unlined and unadorned with design, and they slide right into the back cover of the binder. The 3.25" x 6.5" sheets of linen paper are the perfect size for grocery lists and daily tasks. So, yes, I will truly need a lot of them! And lastly, do you see the little white Post-it notes?! 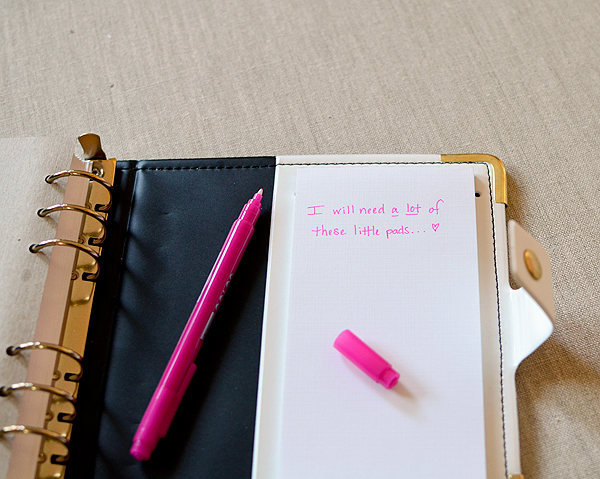 PTI has those now, too--and they even come in a larger, 3" x 6" size--so perfect for lists! No more icky neon green Post-its clashing with my PTI colors! Though I'm a fan of fluorescents through and through, I just can't do them in these already colorful planners. 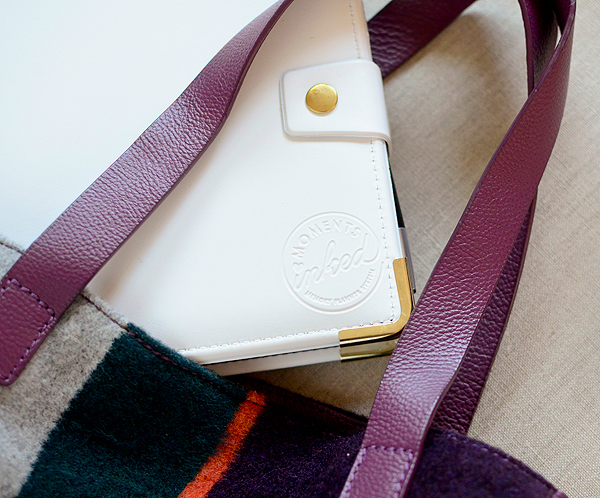 As a completely vain aside, the white binder, with its gold details, pairs so well with my new Boden bag (a Christmas present to myself) and a couple of my favorite notebooks. 2016 is looking good already! Still want to see more of the Moments Inked Planner System? Check out the following posts by Nichole and the MI gals for their takes on it! 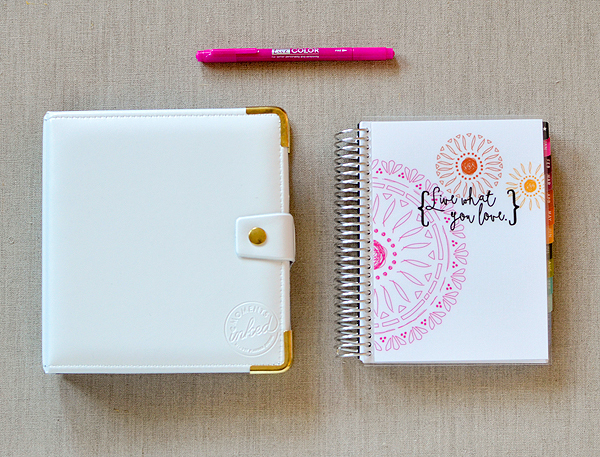 Sign up for the Moments Inked Newsletter here and fresh ideas for using the MI Planner System will magically appear in your inbox every Monday! Great job on your first video tutorial! Loved your show and tell of the new products! Thank you so much, Mary! I hope it's obvious that I'm really excited about the new planners! Beautiful post, Rebecca! I have a question about a different post, if you have a moment. Your video was honest and that's one of the things I love that about your blog. I'm still on the fence about getting a planner since I tend to write things down electronically. I use Wunderlist, Evernote and Google Calendar to keep me organized. I know that I really want to keep track of my food and water intake and that's probably all I'd use it for so maybe the daily pages would be the best for me. I'm looking forward to what the rest of the release in the coming months will bring. Keep up the good job with the videos, Rebecca! Dorayley a. k. a. Rae - I use Evernote too! But I use it for inventory of my stamps and dies believe it or not. Google calendar helps a lot, but sometimes, I need to be able to write things down about appointments, clients, etc. I stayed away from planners due to the planner craze of overstuffing them with stickers and stuff, I am not 16 anymore, nor do I need a bloody diary for my unicorn stickers! I need simple, clean lines with spaces to write info, keep dates, etc. 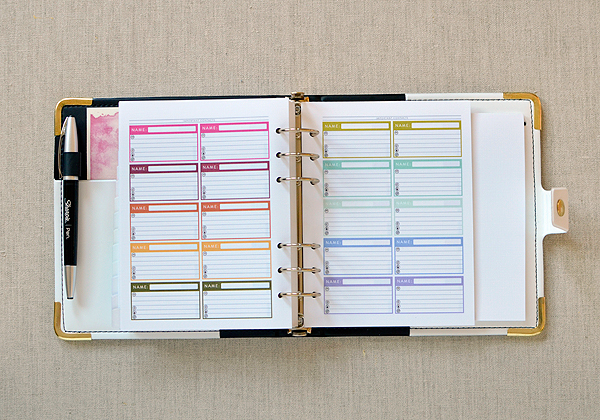 I think I may have actually found a planner for me right here on PaperTrey!! Thank you, Rebecca for the video. Question - where did you get the little notebooks? Are they from the Moleskin line or something else?